Norwegian is spoken by nearly five million people in Norway and the United States. This 1874 translation of parts of the 1789 BCP of the American Episcopal Church, prepared for Norwegian emigrants to the United States, uses an early modern form of Norwegian variously called Dano-Norwegian or Rigsmål/Bøkmål. This form of Norwegian is very similar to Danish. Most Norwegians are members of the (Lutheran) Church of Norway, which is in full communion with the Church of England and some other Anglican churches through the Porvoo Agreement. There are a small number of Anglican churches in Norway, all congregations of the Diocese of Gibraltar in Europe. "My translation of the Mission Service has been introduced, but without success. The Scandinavians cling to their ancient Lutheran service, and any alteration in that respect is useless. [...] Now what is the meaning of this Mission among the Scandinavians? Chiefly to make our Church known amongst them, and, if possible, in the course of time, in a peaceful manner, to join together the Lutheran and the Episcopal Churches here in the West. . . . But, if any one should look for great and immediate results, he would deceive himself in a most cruel manner." 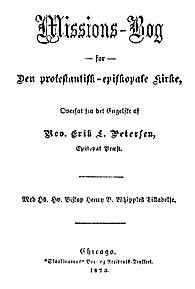 Petersen arrived in the United States in 1872 as a Roman Catholic deacon intending to work in missions among Scandinavians. He served for only one year as a priest in Minnesota before his marriage and reception into the Episcopal Church in Minneapolis. From 1873 until his suicide in 1887, Peterson worked in Faribault and elsewhere in the Diocese of Minnesota in the formation and leadership of Norwegian-American Episcopal congregations. His wife Anne Sophie (Olson) Petersen (1838-1923) translated the hymns appended to the printed version of this Prayer Book. Much more information about Erik Petersen's life and writings is available in an article by Jacob Hodnefield published in the Journal of Norwegian-American Studies (Volume 15, 1949) . This book is listed in David Griffiths' Bibliography of the Book of Common Prayer as 123:1, and is briefly described by Muss-Arnolt. It is written entirely in the German Fraktur (or "Old English") type, as may be seen in the title page at right. Med Hs. Hv. Biskop Henry B. Whipples Tilladelse. This translation of the Mission Service (which is taken from the Book of Common Prayer) was made at my request by the Rev. Erik L. Peterson, and is authorized for use in the Missions of the Diocese of Minnesota.